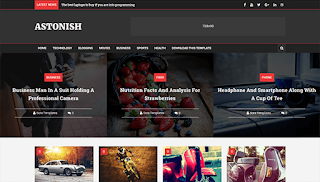 Astonish Blogger Template is a one of the most Modern, Clean and Creative Blogger Theme. A creative and unique style with fantastic slider, numerous post formats and excellent promo blocks will attract new visitors and you will breathe new life into your blog. Just give your blog a little Astonish. Fully responsive, fits any size of display from lower to higher resolutions and supports all modern browsers. Let’s make your blog the source of inspiration. How to setting this theme dear? Help me please..